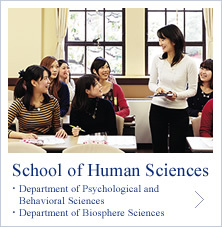 The undergraduate program at Kobe College is comprised of three academic schools and five departments. 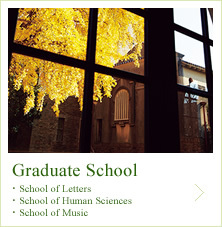 The post-graduate program offers education in three disciplines. As an institution that emphasizes small-class learning, the low student-to-teacher ratio provides students with personalized attention and quality support to help each one realize her potential. Seeking to provide a well-rounded education to cultivate individuals with a broad perspective, Kobe College offers a variety of cross-disciplinary studies. Courses include: women’s studies, psychology, education, philosophy, history, culture, art, natural science, information science, foreign languages, physical education and Christianity. Selecting subjects from areas of particular interest gives students a chance to build their foundation for future research. This is a required English program for all Japanese students at Kobe College to help them gain a good command of English. Original texts and smartphone applications are utilized for studying grammar and vocabulary. The program is linked with students’ major courses, allowing them to learn English terminology needed in their field of study. A course which aims to enhance the students’ understanding of the role of media and improve their writing, presenting, and communication skills. A course where students develop an appreciation of art and skills needed for art production and management, through gaining specific knowledge of the arts and learning organizational management. A course designed to cultivate the ability to communicate effectively and with compassion, transcending differences in physical ability, gender, culture, and nationality, through training in manners and emergency care. This program employs unique techniques used for training professional interpreters and aims to raise students who excel in English. Classes are taught by experienced interpreters and translators, using technological equipment equivalent to those used in international conference halls. Seeking to develop leaders in society, this program requires students to plan and organize regional events to foster development and tackle regional problems under the mentorship of experts in the business world, public administration, and NPOs. 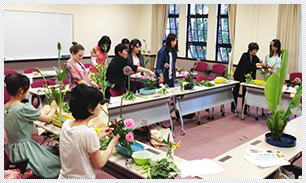 Special courses in Japanese culture and language are available for international students. 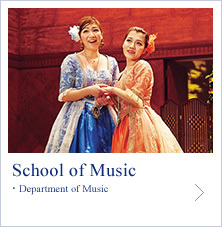 Students may also select their courses from a wide range of other disciplines according to their interests. Composed of a mixture of lectures and activities, the course provides students with an opportunity to acquire knowledge and experience Japanese culture and traditions first-hand. 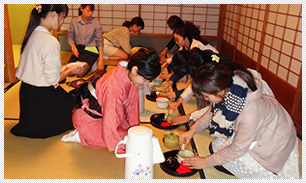 Cultural activities include: tea ceremony (the Way of Tea), Kado flower arrangement, Noh theater, origami (paper folding art), and Aikido (martial arts). This course is designed to help international students understand and consider current issues in Japan. Taught by several instructors who are experts in their fields, each class deals with a variety of issues including Japanese politics, international relations, law, religion, and business. The tutorial system allows exchange students to pursue advanced learning on a one-on-one basis with an academic advisor. The student may choose an advisor from the faculty members at Kobe College according to her field of interest, and design the content of the course together. This course aims to help students acquire basic skills in Japanese grammar and vocabulary, and develop the ability to read simple sentences about everyday topics. 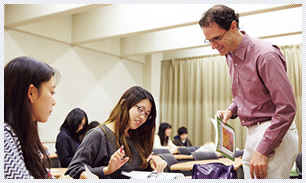 This course is designed for advanced-level speakers of Japanese. Students will read passages from novels, newspaper columns, essays, etc. and make presentations in class. 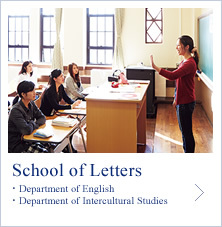 This is a high-level Japanese course that enables students to develop advanced-level grammar and vocabulary skills through intensive training in reading research materials and writing papers. In addition to hiragana and katakana writing practice, students will learn vocabulary and basic Japanese sentence structures. This course aims to train students not only to master primary level grammar, but to use the grammar skills such as transitive / intransitive verbs, causative and passive expressions, in writing.